Multiple Breakers – Provides greater flexibility in meeting code requirements for the separation of circuits necessary for emergency and fire pump loads. This option is available on traditional Generac MPS units in 400 to 600 kW diesel configurations and natural gas configurations greater than 300 kW. The externally mounted insulated case paralleling breakers can be sourced through us. Please contact us for more information, 866-288-3685. Reaffirming Generac’s continued commitment to integrated paralleling, we are pleased to announce the expansion of the MPS product line to include generators 800 to 2000 kW. These units will be configured for integrated paralleling through Generac’s I-panel genset controller and an on-generator insulated case breaker. This configuration provides system designers an alternative choice to the external paralleling, switchgear based configurations that are also supported with the 800 kW and larger products. This MPS configuration for these larger units is also available with a Power Manager System Controller (PM-SC). It is a feature that provides system level local and remote monitoring of all the generators in addition to supporting permissive and load shed logic. Generac now offers a secondary breaker option on select MPS generators. This solution looks and feels like a traditional multi-breaker configuration on single generator configurations, while still supporting the MPS parallel operation. This option allows you to configure an emergency system or fire pump breaker to be located on the opposite side from the generator’s main output — integrated paralleling switch. This secondary breaker approach meets “separation of circuits” requirements on many projects without the need to use a connection box or multi-section distribution panel. The secondary breaker will be fed directly from the alternator output. This avoids having to selectively coordinate through the alternator’s main output breaker. The breaker’s current draw will be captured by the generators CT’s resulting in maintaining the standard MPS generator load balancing functionality. Since the loads connected to this secondary breaker will be allocated to a single generator, this solution may not be the right choice for all applications. This optional configuration is available on traditional Generac MPS units in a diesel configuration of 400 to 600 kW and natural gas configurations greater than 250kW. If you have questions or need assistance with a specific application, please contact us, 866-288-3685. 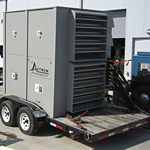 A comprehensive preventative maintenance program is critical to the reliability of your standby generator. As part of your annual maintenance, ESSE technican’s recommend performing a load bank test. A load bank test essentially tests the generator set at full load, making sure that the system performs properly. Your generator engine is designed to run at full load – and lightly loaded systems, or those exercised weekly without load, are subject to performance deterioration and wet-stacking. What is wet-stacking? Wet-stacking is a condition in which not all of the fuel is burned. This unburned fuel instead passes through the exhaust valves into the exhaust side of the turbocharger and the exhaust system. This usually occurs when the generator is running at only a small percentage of its full capacity. Wet stacking is detectable by a black “tar-like” discharge around the exhaust pipe connections and around the turbocharger. This discharge accumulates leading to increased engine wear. The results include higher maintenance and repair costs and ultimately a shorter engine lifespan. Testing standards set by NFPA 110 and the Joint Commission on Accreditation of Heath Care Organization(JCAHO) require load testing at levels recommended by your generator manufacturer. Call Energy Systems Southeast today to add this valuable test to your preventative maintenance plan! Data centers often seek third-party certification from the Uptime Institute for use in their marketing. The Uptime Institute is a data center research, education and consulting organization. Generac now offers a “Mission Critical Continuous” rating to clarify our compliance to the Uptime Institute’s requirements for data centers. To meet the most rigorous levels of requirements – Tier III and Tier IV – diesel generators are considered the primary source of power, not the utility. This means the engine-generator system must be scaled to carry the entire load of the data center, providing constant power with no runtime limit. Generac Industrial generators are compliant with these requirements. We frequently hear that generators must have a continuous rating to qualify for Tier III and Tier IV data center projects. That requirement is typically driven by a miscommunication from the building owner or architect who references the Uptime Institute’s guideline for Tier compliance. This is where confusion about specifying generators for these applications arises. Continuous Power (COP) The rating definition for COP is “Constant load: Unlimited running hours.” This rating applies to a generator set paralleled with an infinite bus (e.g. a national electric supply network or grid) where the generator set must run at 100% load, 24 hours a day. Prime Power (PRP) The ISO PRP definition is “Variable load: Unlimited running hours.” This rating pertains to applications where no supply network or grid is available and the generator set is used to supply power 24/7. Emergency Standby Power (ESP) The ISO ESP definition is “Variable load: Limited to 500 hours per year.” This rating is suitable for classic standby power applications. Generac Industrial generators satisfy all the ISO ratings, including ISO COP. While the Uptime Institute references the ISO definitions, they do not require Tier III and Tier IV facilities to use ISO continuous-rated generators (100% load). 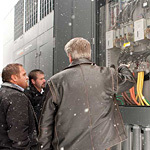 These generators are frequently specified for data centers because it’s a “no brainer.” However, this often results in units being oversized for the application. A generator de-rated to 80% at continuous load meets the Uptime Institute’s requirements. Using generator-engine systems that do not have the ISO continuous rating does not mean the engine-generator system is less capable, as it must carry the entire data center load during an outage. Continuous power engines are considered utility-grade. In fact, commercial-grade engines are the same physical product as utility-grade engines. They are built by the same manufacturer, using the same parts and materials, so they also withstand the demands of applications requiring no limitations on runtime. Confusion is also caused by the need to comply with EPA emission requirements. EPA standards for stationary non-emergency generators require extensive exhaust after-treatment systems such as SCR’s and DPF’s. 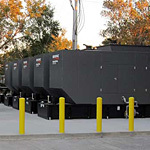 EPA emission standards for emergency standby generators have a 200 hour runtime limitation – a direct conflict with the Uptime requirements. However, EPA does acknowledge that gensets for data centers would only be operated for extended runtimes during a true catastrophe and at the same time, operate at only 80% load, so the gensets can obtain a nameplate signifying compliance with both mission-critical continuous standards and EPA. Note: Uptime does not specify emissions requirements. Warranty and commercial aspects also do not prevent Uptime compliance, since the limitation on runtime hours is only a financial consideration. Some generator manufacturers have created special “data center” output rating categories, primarily for marketing purposes. Generac Industrial Power Generators with the Mission Critical Continuous rating meet the same requirements as competitors, so customers can obtain certification from the Uptime Institute. If you need a Mission Critical Continuous rating on your generator system contact us. We will submit an application to Generac. They will review the loads and other aspects of the application and determine whether it can run without a limitation on runtime hours. Once approved, a letter will be provided that is acceptable to the Uptime Institute for the certification process. If you have questions or need assistance with a specific application, please contact us. *The Tier standards are defined in the organization’s publication Tier Standard: Topology, available at the website, www.uptimeinstitute.com. 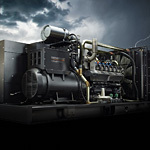 Generac is pleased to announce the introduction of their 350 kW natural gas standby/*prime generator set. The 350 kW has become a popular size node and fits well with their strategy to offer more natural gas solutions to meet every market need. This new genset will utilize the same Generac 21.9L engine as Generac’s recently released SG/MG400, while providing all the benefits of a natural gas solution. As with all of Generac’s configured generator sets 100 kW and larger, this unit will also be available as a paralleled option. And consistent with all of their other natural gas solutions, is listed to UL2200 listed, CSA, EPA and SCAQMD certified, and will meet fuel inlet pressures of 7-14 in. H2O . To download Generac’s new whitepaper, “Understanding Natural Gas Fuel Reliability for Backup Power,” click here.